FlorEssence Tea 17 fl. oz. FlorEssence is a formula that is safe and effective for everyday use, short term and long term. 6. Blessed Thistle (Cnicus benedictus) It has long been used as a digestive tonic and a diaphoretic to support skin detoxification. * This thorny plant contains B-complex vitamins as well as calcium, iron, and manganese. 25 Day Basic Detox: Three 17 oz. bottles of liquid Flor-Essence Tea. 30 Day Premium Detox: Three 2.2 oz. packages of dry blend Flor-Essence Tea plus one extraction bag. 60 Day Advanced Detox: (3)Three 2.2 oz. packages of dry blend Flor-Essence Tea plus one extraction bag. 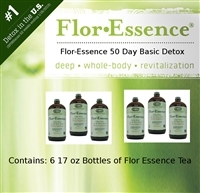 50 Day Basic Detox: Six 17 oz bottles of liquid Flor-Essence Tea. 90 Day Advanced Detox: (6) Six 2.2 oz. 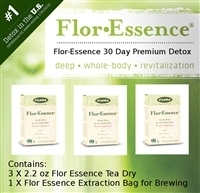 packages of dry blend Flor-Essence Tea plus three extractions bags. 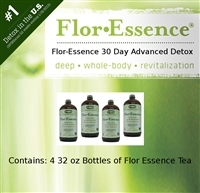 30 Day Advanced Detox: Four 32 oz bottles of liquid Flor-Essence Tea. 180 Day Ultimate Detox: Twelve 2.2 oz. packages dry blend Flor-Essence Tea plus 3 extraction bags. 30 Day Premium Detox: Eight 32 ounce bottles of liquid Flor-Essence Tea. 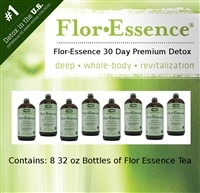 60 Day Ultimate Detox: Twelve 32 ounce bottles of liquid Flor-Essence Tea.